After the enormous success of Gravity, Alfonso Cuarón could have done anything he bloomin’ well liked to follow it up. He could have easily been drawn to safer franchise fare (kind of like he did with Harry Potter and the Prisoner of Azkaban), or continued making films that audiences could easily access as opposed to some of his grittier and experimental movies like Children of Men and Y Tu Mamá También, but whatever he would end up doing, one thing was for certain: it would be something that only Alfonso Cuarón could bring to extraordinary life on the big screen. This exact thing can easily be said about the follow-up he ended up going with, but while it is a very personal film based on his childhood in early 70s Mexico, Roma is far from being a self-indulgent reflection on his own experiences, and is instead an incredibly realised, passionately crafted, and extremely emotional celebration of family, life, and a very special person who Cuarón without question holds close to his heart. That person being his childhood nanny, a Mixtec woman known as Libo, who cared for Cuarón and his siblings when they were growing up in the Roma district of Mexico City, and who this film is dedicated to at the very end. You can tell that he really has a special place in his soul for this person, who undoubtedly had a massive impact on not just his early life but his eventual career path too, and this film brilliantly dramatizes her story to let audiences discover who this person is and how her human spirit is a burning example that we must all strive to eventually become. In the film, set across a number of months, Libo is dramatized as Cleo (played by Yalitza Aparicio in an absolutely astonishing debut performance), one of two housekeepers working for a middle-class family living within the city. The family, comprised of two parents and four reasonably young children, all treat Cleo like one of their own, and in return she does the dishes, keeps the house clean, and clears the driveway of dog crap. Things become a little tricky when the father (Fernando Grediaga) heads off on what he claims to be a work trip, but it is painfully obvious that he does not intend to return; in the meantime, mother Sofia (Marina de Tavira) as well as Cleo keep the children occupied while struggling to fill the hole he has left. On top of that, Cleo discovers that she is pregnant, but her boyfriend Fermín (Jorge Antonio Guerrero) wants nothing to do with the baby when she tells him. There are hints of themes about class and even race peppered throughout, given that the focus is on a lower individual working for a reasonably well-off family, but Cuarón is infinitely more interested in recreating with as fine details as possible the world he once roamed as a child, and especially its inhabitants. The camera – operated by Cuarón, who also served as his own cinematographer since his regular DP Emmanuel Lubezki was unavailable – often pans left and right to let us soak in all the atmosphere surrounding the frame, giving the audience an illusion of floating through a memory of someone who clearly looks back on all of this fondly. That effect is crystalized by the decision to not only show it in black-and-white, but to shoot it in digital as well, further enabling us to look at a clear-as-day snapshot of the past that is largely free from grainy imagery and, even more remarkably, full of colour even when there’s not one that’s ever shown on-screen. Many of the shots linger on just a scene unfolding in the street, and the main characters just blend in to it so naturally that you forget that they’re there half the time, because there’s just so much else going on that grabs your attention more, whether it be a marching band or even a human cannonball, that you kind of want to spend a lot more time in this place and era, along with these characters who you know and like enough to want to be right by their side at all times. There are also entire scenes that could easily have been cut for time and would have made no impact on the overall story, like a glimpse at a martial arts training group and the spiritual teachings of their well-regarded instructor, and another shot that lingers on a man dressed in a monster costume singing a solemn tune whilst in the background people are trying to put out a forest fire, but these scenes end up being so fascinating and full of character that you end up feeling glad that he didn’t get rid of them, even though the movie comes in at over two hours long. In short, Cuarón has perhaps made one of the most impressive snapshots of life in a certain period of time that has ever been put to film, all thanks to his incredibly passionate memory of a time and place he so eagerly wants to share with the world, which is no easy feat but has been accomplished all the same. At the same time, it is not a hollow experience; the film is beaming with emotion of all sorts, including warm love, quiet fear, fierce anger and, in one later pivotal scene set in a hospital, absolutely gut-wrenching. It’s a wondrous celebration of the goodness in people’s hearts, what makes them stand out in the crowd, and how they can end up changing another person’s life for the better. Cuarón certainly feels that way about Libo, and now I do too with Roma, one of the year’s absolute best films. 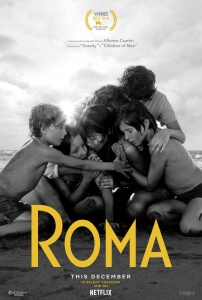 Roma is a beautifully realised celebration of life that sees director Alfonso Cuarón revisit his childhood in a technically marvellous, brilliantly acted and emotionally driven mini-epic that ultimately pays tribute to a very special figure from his early years that’s as loving as it is utterly fantastic. One of the year’s very best films; do not miss this masterpiece.